We have an impressive list of references showing that we are one of the best companies in the business. Waterfront Construction will custom build according to your wishes and the design, construction, and installation are carried out exactly per our customers’ request. 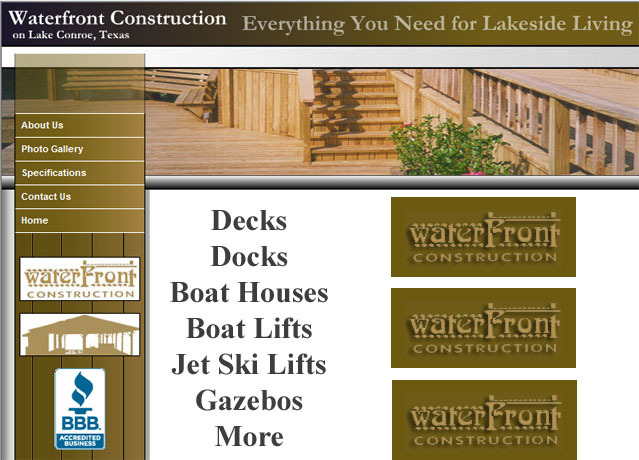 Waterfront guarantees all work, offering warranty maintenance and repair on every project we handle. We are completely insured and licensed. All employees are covered by workman’s compensation. All of our work is controlled in-house; nothing is contracted out, so we can promise extraordinary craftsmanship from start to finish. Our staff at Waterfront Construction has worked closely together for many years, and quality has always been our top priority. We never cut corners when it comes to perfection, and this has been shown over the 15 years our company has served the Lake Conroe area. Why have the ordinary? Allow your imagination to soar. Build with style! Call us for more information and a free estimate. We will also provide references upon request.